Technology companies rose sharply on Wall Street, pushing the Nasdaq composite to another all-time high. The biggest winner in the sector by far was software maker CA, which soared 19 percent after agreeing to be acquired by Broadcom, a chipmaker. The broad advance wiped out the market's losses from a day earlier, when new tariff threats from the U.S. against China rattled investors. Health care and industrial companies also bounced back. Johnson & Johnson rose 1.2 percent and Honeywell climbed 2.3 percent. The S&P 500 jumped 24 points, or 0.9 percent, to 2,798. The Dow Jones Industrial Average gained 224 points, or 0.9 percent, to 24,924. The Nasdaq composite added 107 points, or 1.4 percent, to 7,823. Bond prices rose. The yield on the 10-year Treasury slipped to 2.85 percent. Stocks are rising in midday trading on Wall Street as technology companies resume their upward march. Apple climbed 1.6 percent Thursday, and software company CA soared 18 percent after agreeing to be acquired by Broadcom, a chipmaker, for $18.9 billion. Broadcom plunged 15 percent. Health care and industrial companies are also higher. Johnson & Johnson rose 1.1 percent and Honeywell climbed 2.1 percent. The S&P 500 jumped 19 points, or 0.7 percent, to 2,793. 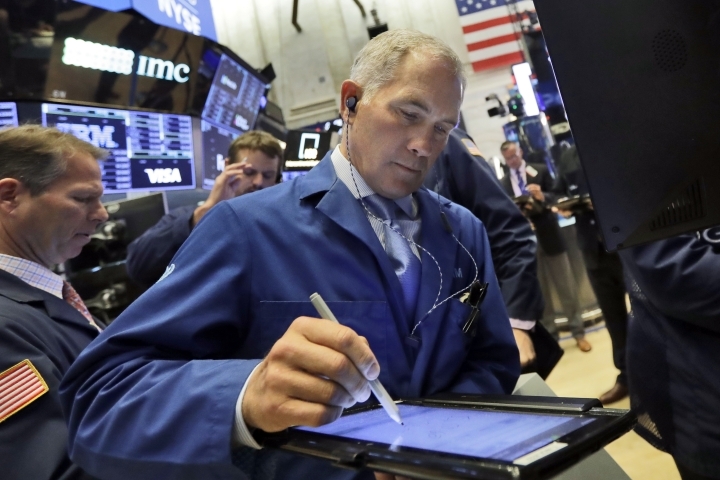 The Dow Jones Industrial Average gained 217 points, or 0.9 percent, to 24,921. The Nasdaq composite added 84 points, or 1.1 percent, to 7,800. Stocks are opening higher as technology companies rally. Apple rose 1.3 percent Thursday morning. IT management software company CA climbed 17.9 percent after chipmaker Broadcom agreed to buy it for $18.9 billion. Energy and industrial companies also recovered a fraction of their losses from the day before. Comcast added 0.4 percent after it raised its offer for British pay TV company Sky to $34 billion, surpassing a bid from Fox. The S&P 500 jumped 11 points, or 0.4 percent, to 2,785 after a 0.7 percent loss Wednesday. The Dow Jones Industrial Average gained 156 points, or 0.6 percent, to 24,856. The Nasdaq composite added 40 points, or 0.5 percent, to 7,757.